(c) Insert the pin (stopper) into the body hole and install the rear airbag sensor with the nut. If the rear airbag sensor has been dropped, or there are any cracks, dents or other defects in the case or connector, replace it with a new one. When installing the rear airbag sensor, be careful that the SRS wiring does not interfere with or is not pinched between other parts. Tighten the nut while holding the rear airbag sensor because the rear airbag sensor pin (stopper) is easily damaged. (d) Connect the connector to the rear airbag sensor assembly. (1) Connect the connector as shown in the illustration (when locking, make sure that the outer connector locking sleeve returns to its original position and a click sound can be heard). When connected, the outer connector locking sleeve will slide. Be sure not to hold the outer connector locking sleeve while connecting, as it may result in an insecure fit. 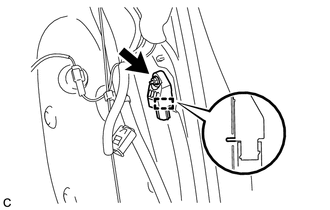 (e) Check that there is no looseness in the installation parts of the rear airbag sensor.